Actions have consequences. Being ignorant or stupid doesn't excuse responsibility for your actions and they may have a lasting impact on the rest of your life. I don't think we could ever overcome ignorance but we have to keep educating in the hope of realization. Ignorance makes a man go through life while wisdom, knowledge, and high positive thinking IQ makes a man grow through life. Knowledge is measured by degrees of ignorance. You have learned and you claim that you know, and yet you live like an ignorant. Stupidity is doing the same thing over and over and expecting a different result. Ignorance is not caring. Life can be very simple, but igorance insists on making it complex. Love is understanding and hate is ignorance. Ignorance is a state which refers to lack of knowledge. Ignorance spells unawareness. When a person is ignorant, he or she is simply informed about something or the other. 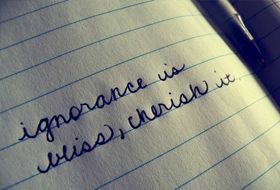 Ignorance and foolishness are two completely terms though both of them can lead to unwise repercussions. Ignorance is not bliss, anyways. Awareness regarding things in your vicinity always helps. In the words of Winston Churchill, "Socialism is a philosophy of failure, the creed of ignorance, and the gospel of envy, its inherent virtue is the equal sharing of misery. The truth is incontrovertible, malice may attack it, ignorance may deride it, but in the end; there it is." Ignorance is not simply a blank, empty space on a person's mental map, but it has contours and ignorance and for some, rules of operation are also well known. Ignorance never accelerates but only hinders progress on the personal as well as the professional front.